Large-format luxury retailer Holt Renfrew is addressing competition by opening full-sized ‘world of’ leased shop-in-store concessions in an effort to attract the world’s top brands to its stores. Holt Renfrew is taking a page from sister retailer Selfridges in London UK and similar retailers in Europe, some of which offer an expanded assortment of product in concessions that feature accessories as well as ready-to-wear in spaces larger than typical department shop-in-stores. Several ‘world of’ leased concessions have opened in Holt Renfrew stores in Canada, with more on the way over the next couple of years as Holt Renfrew updates its fleet of stores. We recently reported on Fendi opening a ‘world of’ concession at Holt’s Bloor Street flagship — spanning about 3,000 square feet and carrying a full range of bags, accessories, footwear and fashions for men and women, the new Fendi is more comprehensive in its offerings than some of the brand’s standalone units. 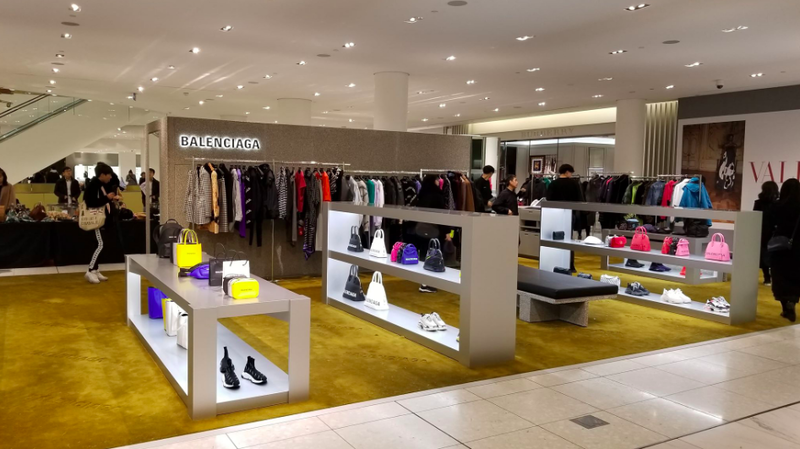 In Vancouver, Holt Renfrew recently unveiled a ‘world of’ concession for super-hot luxury brand Balenciaga, which is a first in Canada for the luxury brand. 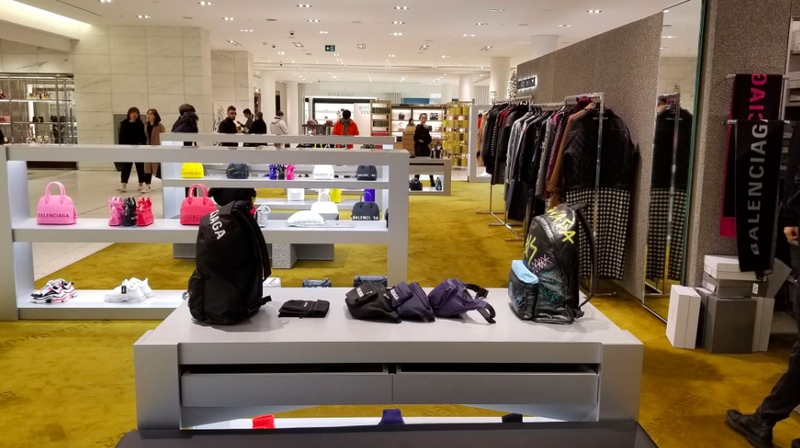 Balenciaga’s Vancouver location also carries a full range of apparel and accessories in an open space on the street level of the CF Pacific Centre flagship, which sells well into the hundreds of millions of dollars annually in the multi-level space. Holt Renfrew kicked-off the ‘world of’ concession expansion when it opened a 3,000 square foot Saint Laurent leased boutique on the street level of its Bloor Street flagship in Toronto in the spring of 2018. The full range of apparel and accessories can be found in the store. More ‘world of’ concessions will be opening in Holt Renfrew stores in 2019. 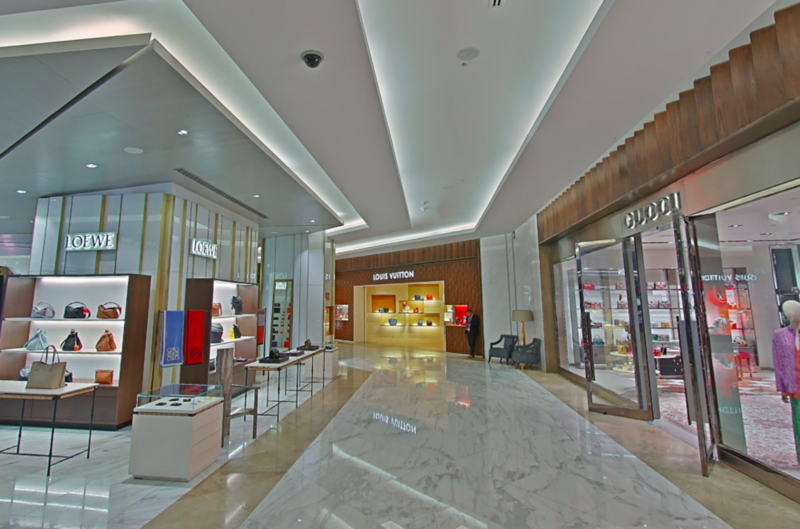 Gucci is set to unveil a large concession space at Holt Renfrew’s highly productive Yorkdale Shopping Centre store in Toronto, which is expanding to accommodate larger concessions for brands such as Dior and Fendi. Burberry is also said to have leased space in the store for a ‘world of’ boutique that will accommodate a full-range of products from the brand. The expanded ‘Holt Renfrew Ogilvy’ store in Montreal, which is expected to be completed in 2020, will also feature large concession spaces for brands such as Hermes (about 3,000 square feet), Christian Dior (about 2,000 square feet) and Prada, which will span about 2,300 square feet, according to the company. It’s unclear which brands, if any, will feature ‘world of’ concessions in the 250,000 square foot Holt Renfrew Ogilvy store — despite having large floor plates, some brands have said that it has been challenging to secure large enough spaces on the highly desirable street level of the store, which will become something of a ‘shopping centre’ with multiple leased concessions for top brands. The comparison to a ‘shopping centre’ could also be used for the Vancouver and Toronto Holt Renfrew stores. Holt Renfrew is dedicating substantial space in its stores for leased departments, which is resulting in a situation where Holts is acting more as a landlord than a retailer. Holt Renfrew will maintain sections in its stores where multiple brands will be showcased, though sections of some stores will become a curated collection of leased boutiques where Holt Renfrew provides space, marketing, and an overall environment to draw-in wealthy shoppers. The model appears to be working for Holt Renfrew. Sales were said to have gone down with the opening of Saks Fifth Avenue and Nordstrom in Canada, though Holt Renfrew has come back and is said to be seeing strong sales numbers particularly from its Vancouver and Toronto (Bloor and Yorkdale) stores. The clustering of the hottest luxury brands in the world acts to attract wealthy shoppers seeking something of a ‘one-stop shop’ where Holt Renfrew acts as a gathering place. As a comparison, Saks and Nordstrom in Canada do not currently feature large ‘world of’ leased concessions. Saks Fifth Avenue’s downtown Toronto store, which opened in early 2016, includes a clustering of luxury accessory concessions including Dior, Fendi and Louis Vuitton (as well as several Saks-run shop-in-stores for brands such as Bottega Veneta, Saint Laurent and Chloé) and the Vuitton concession is the largest in the ground-floor accessory hall with about 1,200 square feet of space, according to Saks. Nordstrom, which typically doesn’t lease space to luxury brand concessions, has done so with a handful of brands such as Chanel and Louis Vuitton in its US stores. In Canada, Nordstrom’s highly productive Vancouver flagship includes a Christian Louboutin concession on its street-level, as well as a leased area for pricey Brussels-based brand Delvaux. In Toronto, Gucci operates a surprisingly large accessory boutique inside of Nordstrom’s CF Toronto Eaton Centre location, and Delvaux operates a boutique at Nordstrom’s Yorkdale location (Delvaux is said to be seeking to open a standalone unit in Toronto at some point, which would be a second in North America for the brand). Holt Renfrew stands to gain from offering a full range from some brands — the store gains credibility with expansive brand offerings, and brand fans are flocking to stores that have an enhanced product assortment. Given the space dedication Holt Renfrew is willing to give some brands, it is likely that Holts will be able to maintain relationships despite the buying power and pull of US-based Saks and Nordstrom. The ‘world of’ concession phenomenon is still relatively new to North America, with US-based Neiman Marcus and Saks typically offering smaller shop-in-store boutiques that often carry only accessories or ready-to-wear. Paris-based Chanel is a remarkable example — in the United States, Chanel’s shop-in-stores are often separated into two spaces, often on different floors, with one shop carrying accessories and another ready-to-wear. 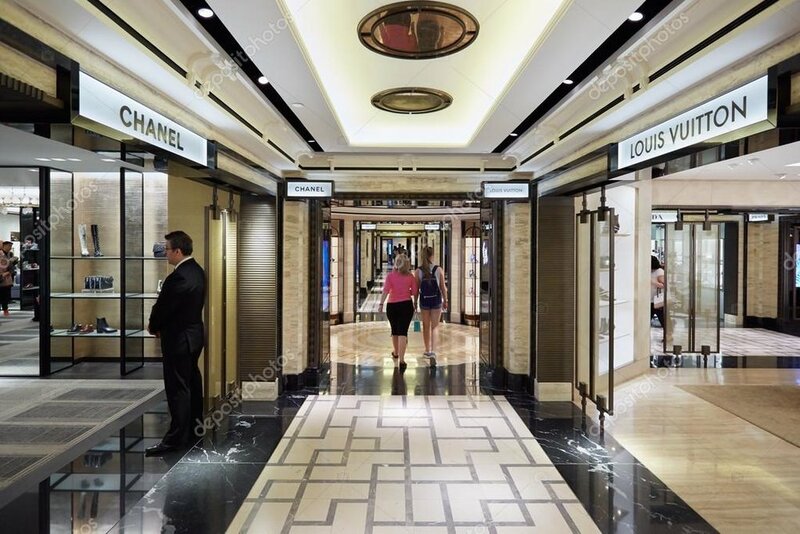 In Canada, all five of Chanel’s concessions in Holt Renfrew stores are in one space that includes accessories, leather goods, footwear and ready-to-wear fashions for women. The Vancouver Holt Renfrew Chanel concession is the largest of its kind in Canada, spanning more than 5,000 square feet. Some say that it is selling more per square foot than any Chanel concession in the world, with annual revenue approaching nine figures. An unintended consequence to ‘world of’ leased concessions opening at Holt Renfrew is that some brands may choose to remain inside of Holt Renfrew, rather than lease standalone retail spaces nearby in the City. In downtown Toronto, for example, it is less likely that Saint Laurent and Fendi will open standalone units in the Bloor-Yorkville area as some had expected — Holts is said to work out deals with its leased vendors where construction costs are shared, and a percentage as rent is paid. Luxury jeweller David Yurman was said to be looking at standalone space in Toronto’s Bloor-Yorkville until Holt Renfrew offered the brand prime real estate formerly housing Louis Vuitton on the street level (Vuitton recently relocated in Holt’s Bloor to a larger space). Vancouver is a different story. Many luxury brands are said to be eyeing space in downtown Vancouver, and the city’s Alberni Street/‘Luxury Zone’ has few spaces available. Balenciaga secured a Vancouver space at Holt Renfrew because the popular brand lacked appropriate street-front space in the downtown core. Bulgari is another example — the Italian luxury jewelry brand opened its first Vancouver boutique inside of Holts in February of 2018 in a 450 square foot space, with the only other Bulgari boutique in Canada being a standalone unit at Toronto’s Yorkdale Shopping Centre, with more than 1,930 square feet. The spectacular women’s shoe floor at David Jones in Sydney, featuring 8 concession boutiques for Louis Vuitton, Chanel, Prada, Gucci, Tod’s, Valentino, Dior and Christian Louboutin. 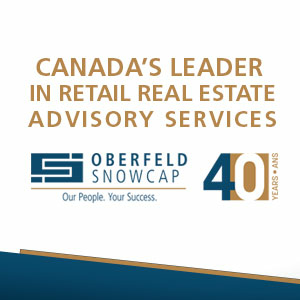 We’ll continue to discuss the ‘world of’ leased luxury brand concession model in Canada as more locations open. The trend is more common in larger global department stores, and Holt Renfrew is utilizing the model in order to create a more dynamic and experiential environment for its target market.